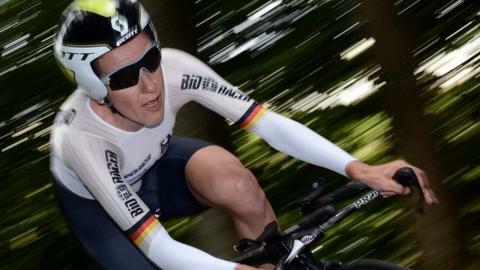 Britain's Emma Pooley and Wendy Houvenaghel both missed out on medals as German Judith Arndt won time trial gold at the Road World Championships. Pooley, the 2010 world champion, finished fourth - nine seconds off a medal while Houvenaghel was 14th. Pooley was always in contention but despite a strong last climb she failed to overhaul American Evelyn Stevens. She then saw Arndt, the defending world champion, and New Zealand's Linda Villumsen finish quicker. Arndt, in her final time trial before she retires next weekend, was the last rider out and looked impressive. The 36-year-old, who won silver in the Olympic event last month, was fastest at all of the checkpoints and triumphed by 33 seconds from Stevens. The time trial route went from the cobbled streets of Eijsden through the hills of the Limburg province, ending in a tough climb up the Cauberg hill in Valkenburg. Villumsen looked capable of catching Stevens's time until she faded on the Cauberg, but the hill held no fears for Arndt who powered up to win another rainbow jersey. Arndt and Villumsen had won silver together in Sunday's team time trial while Stevens had won gold.